Photos by Nathan Fisk (left and right), Aimée Pelletier (centre top), Matthew Morrison (middle), and Sara Wickham (centre bottom). 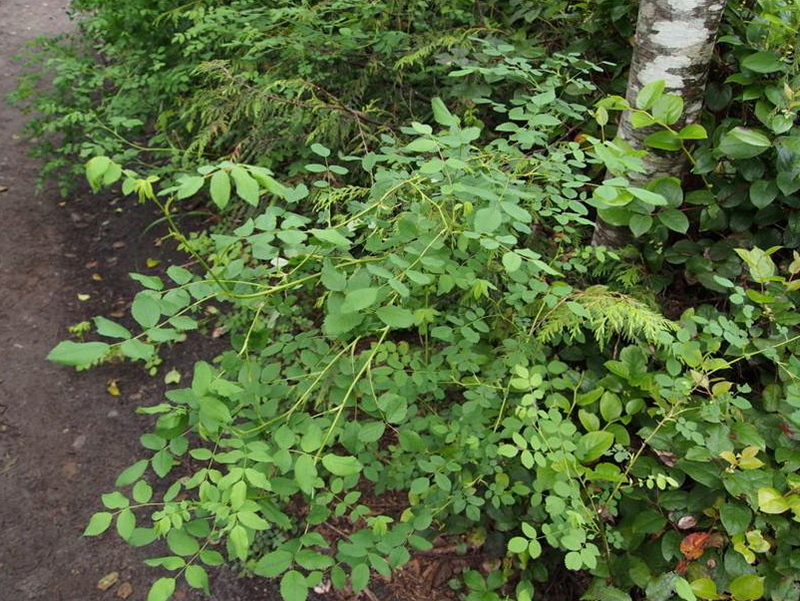 Nootka rose is a spindly shrub which grows 0.5-3 m tall individually or in thickets. Watch out for the large prickles at the base of each leaf and along branches (absent on new growth). Leaves are alternate, deciduous, elliptical with a pointed end, toothed, and grow 1-7cm long. When blooming the solitary flowers are soft bubblegum-pink, large (4-8 cm across), with 5 vaguely heart-shaped petals and yellow stamens. Nootka rose produces rose hips which are purplish red, 1-2 cm across, and bristly. 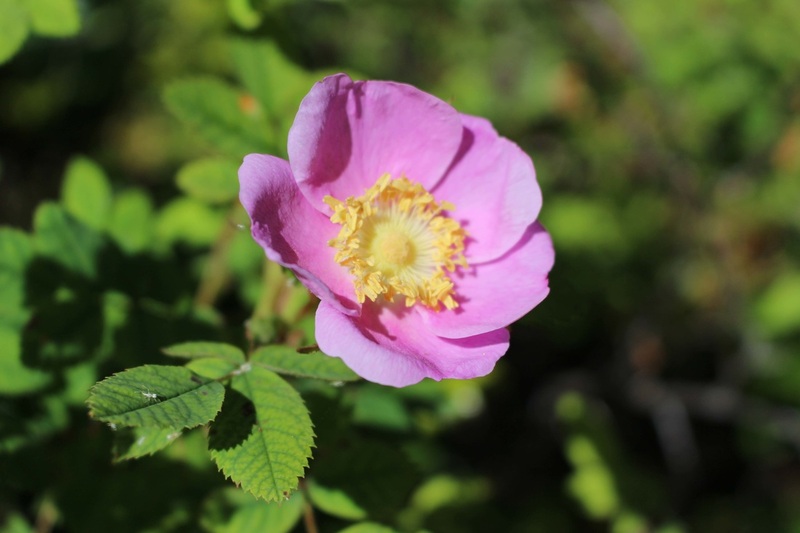 Nootka rose prefers open, moist habitats such as shorelines, thickets, forest edges, meadows, roadsides, and clearings at low to mid elevations. It is commonly found throughout southern BC, and infrequently found northward. 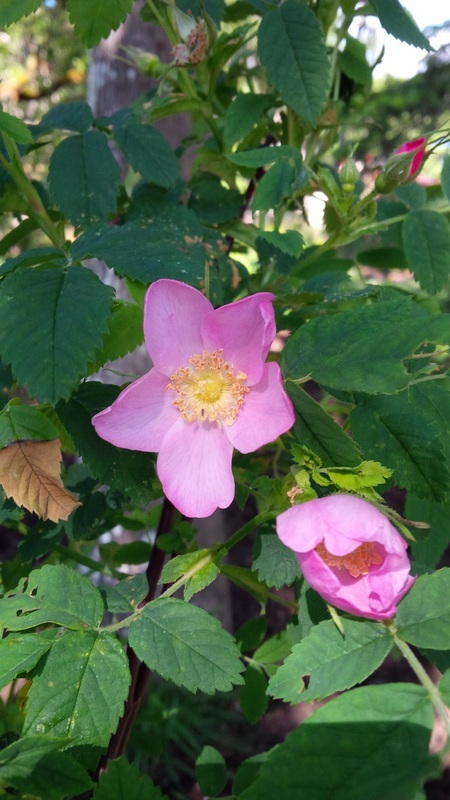 Clustered wild rose (Rosa pisocarpa) is a similar coastal rose which has prickles at the base of its leaves and is found in moist habitats from the Fraser Valley to Vancouver Island and south to California. 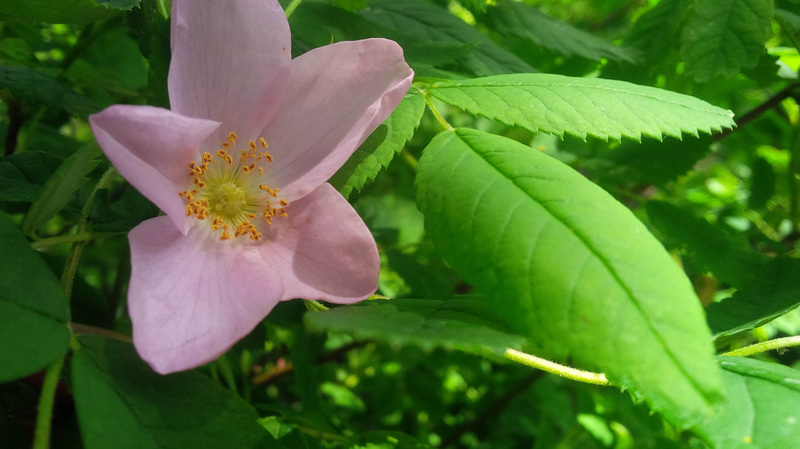 Clustered wild rose has smaller, clustered flowers (as opposed to the solitary flowers of Nootka rose), and sharper pointed leaflets. 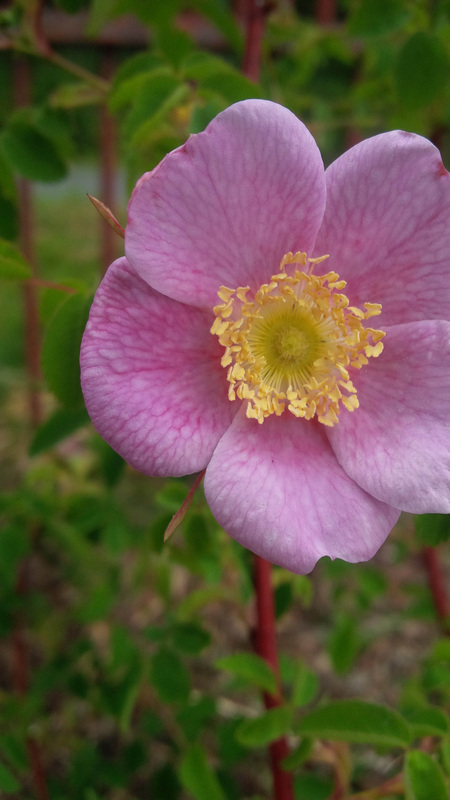 All species of wild rose were traditionally used in steaming pits, root storage pits, and cooking baskets. Rose leaves were often placed under and over the cedar cooking baskets to add flavour and prevent contents from burning. Tender young shoots can be stripped and eaten raw. A tea made from the branches or strips of bark can be used as an eyewash to reduce cataracts and enhance eyesight. The Makah mashed the leaves to make a poultice for sore eyes and wounds. Pojar, J. and MacKinnon, A. (1994). Plants of Coastal British Columbia. Vancouver, BC: Lone Pine Publishing. P. 74. Rosa nutkana C. Presl, Nootka rose. Ker Gawl. In Klinkenberg, Brian. (Ed.). E-Flora BC: Electronic Atlas of the Plants of British Columbia. Lab for Advanced Spatial Analysis, Department of Geography, University of British Columbia, Vancouver. Accessed 28/11/2014.